Valerian's persecutions were in full force and had driven the Christians underground to the catacombs. Meeting among the graves and bodies of the catacombs, the Christians worshiped together in secret knowing very well that their discovery would result in their death at the hands of the Empire unless they were willing to deny their faith and their Lord. And, so, the cautious Christians met among the dead and in a place of death so that they might preach life more abundant and free. Among their own fallen friends and martyrs, they passed the cup and the loaf that proclaimed a silent witness to the union they held with each other, those who had gone before, and those who could come after. This communal meal they shared--the innermost of the Christian mysteries--was a powerful thing that they held sacred and holy and that held them together. After the Christians had joined together in their holy meal,they reserved a portion of the elements for those who could not make it to the meeting because of the Empire's interference--as was their custom. The priest knew that his face was marked for execution and, therefore, he knew he would be unable to visit the prisoners awaiting martyrdom. Usually, this meant giving the elements to a deacon who would be less recognizable. The deacon would be able to visit their brothers and sisters in jail and provide them with the elements that proclaimed their unity and united all of them as one body with their Lord. On that particular day, however, no deacons had made it to the service. Likely, they had been unable to make it because of the Empire's interference and invasions. Unwilling to betray the secret place of worship of their brothers and sisters, they did not make it to the service. And, yet, their brothers and sisters awaiting martyrdom under the Imperial persecutions were waiting for the elements. Sure, they could have simply not sent anybody for fear of the Empire but this was absolutely inconceivable for the Christians. To fail to send the elements of their unity and communion would be to abandon their brothers and sisters and pay an homage of fear to the Imperial beast. The martyrs--those who had not abandoned the Church even in the face of death and torture--could not be abandoned by the Church. Even if it meant risking life and limb, the Church was unwilling to abandon its own or allow fear and persecution to snuff out love, grace, and mercy. So, Tarcisius--a twelve year old boy who had helped the priest in the service--volunteered to secret the elements to the prisoners that day. He took them and left the catacombs. Tarcisius held the elements close to himself to conceal them from the crowds he crept through. This holy mystery of the Church was priceless to the boy and to the Church. As he approached the prison, a group of boys called to him. They were his non-Christian friends and they hoped he would join in the game they were playing. Tarcisius declined the invitation and held the elements closer as he walked a little faster toward the prison. The boys called after him to ask what it was that he was carrying and being so careful to hide. Tarcisius wouldn't lie but he couldn't imagine exhibiting the holy and special mystery of the Church before the boys as if it were some thing or product. Instead, he said nothing. One of the boys, somehow knowing that Tarcisius was a Christian, shouted to the others that he must be carrying part of some Christian mystery. Eager to know what it was that the Christians did in secret--there were rumors that they were cannibals, atheists, and incestuous--they rushed at Tarcisius demanding to see what he had. Tarcisius refused to make the Christian mystery common and profane their holy unity with their Lord. So, his friends jostled him and shook him. They wrestled him to the ground hoping to pry it from his grasp but he refused. They punched him and kicked him thinking that they might knock his grip loose. When it failed, they hit him harder and tore at his flesh with their hands. He refused to fight back and he refused to submit. The boys, finally, gathered stones and proceeded to throw at the injured and weakened Tarcisius. Whether they did it intentionally or things got out of hand, the boys killed Tarcisius. Turning over his corpse, they moved his hands hoping to see the Christian mystery and keep it for themselves as their prize. They found nothing. Later that night, Christians gathered the body of their brother Tarcisius and brought it back to the place of their meeting. They buried him in the catacombs. 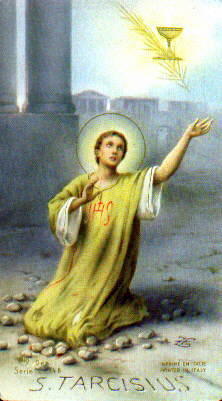 Their mystical unity and communion had been preserved by this young boy and they upheld him as a brother even in death. They continued to meet throughout the persecutions in those catacombs and look to young Tarcisius' grave to remind themselves that they could not abandon each other and that some things are worth dying for. Every time those Christians gathered together around the table, they proclaimed a unity that transcended death and foreshadowed the already present and, yet, still arriving Kingdom of God. 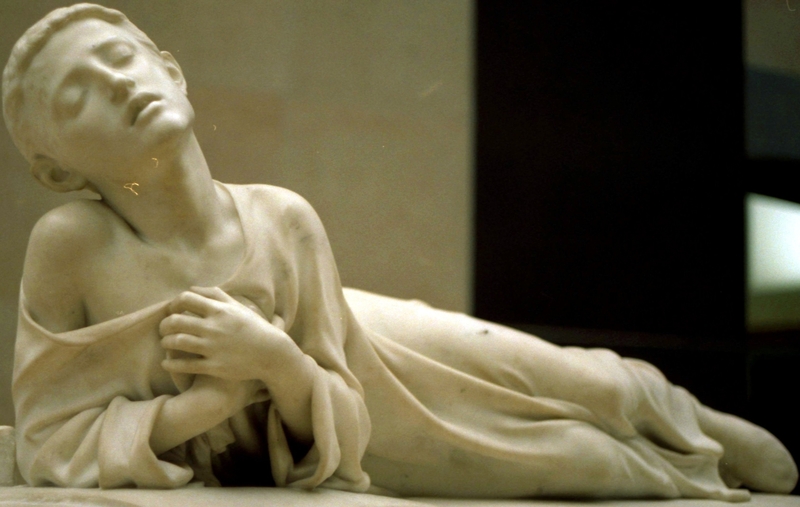 In that mystery--the mystery that Tarcisius gave his life to keep--the Christians enveloped each other and endured death in the name of love.